- My iPhone is not playing videos in any kind. When the movie is about to start, I get the black screen but then I get the play button with a circle and a line in it. The 3rd party apps won't play either. Any suggestions? - I restored old videos via iTunes from my backup to my iPhone 6. However, some of them do not play. They simply have the loading circle but nothing happens. Everything else restored OK, pics, music etc, just the videos are not working. Can anybody help? If iPhone won't play videos any more, how to make it run as normal? This article can help you dig out the answer. WinX MediaTrans, an innovative file transfer software for iPhone, enables users to sync any types of video (MKV, MTS, AVI, WMV, FLV etc.) from computer to iPhone (XS/XS Max/XR etc.) with iOS (12) compatible formats for playing videos on iPhone smoothly thanks to built-in video converter engine. And, auto-rotate technology can change video from vertical to horizontal for full screen video playback after transferring. The most common reason of videos not playing on iPhone is that the video you try to open is not supported by the device. So, what types of video can run well on iPhone? ▪ Motion JPEG (M-JPEG): up to 35 Mbps, 1280x720 pixels, 30 frames per second, audio in ulaw, PCM stereo audio in .avi. How to Handle 'iPhone Won't Play Videos' Problem? In order to get any videos played on iPhone, a part of users install third-party media players (VLC, KMPlayer etc.) for iOS. However, various playback errors may bother you now and then, for example no images, only audios; too slow to play a video; even crash during playback. It's better to make every video with an iPhone acceptable format to slove "not playing" error. 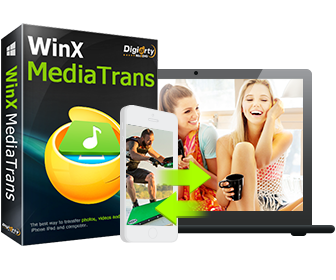 WinX MediaTrans is not only mobile file transfer software to sync videos, photos and music between computer and iOS devices, but plays as an video converter during video transfer. 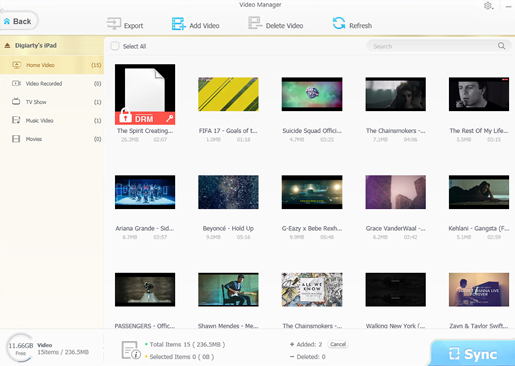 It allows you to copy videos in any quality (SD/HD/4K/8K) and format (MKV, MTS, FLV, WMV etc.) from computer to iPhone, iPad, iPod Touch and meanwhile convert videos to MP4 (H.264) which is fully supported by iDevices, to make sure every video can be played on iPhone (XS/XS Max/XR etc.) without no error at all. Once transfered, WinX MediaTrans can rotate video from vertical to horizontal giving a better full screen viewing experience. Download/install WinX MediaTrans on your Windows (10) PC and follow the steps to transfer videos to iPhone for fixing 'iPhone won't play videos' problem. If you are a Mac user, please switch to the Mac version. Step 1. Launch WinX MediaTrans. Plug in your iPhone to computer. Unlock the screen and tap "Trust" if the messsage pops up asking whether trust this computer or not. Step 2. After the connection succeeds, the main interface with five modules will be shown. Click "Video" to enter the page where all videos stored in your phone are listed. There are several categories on the left sidebar. Select one category and hit "Add Video" button to import video. Notice: You are not allowed to add video to Video Recorded and Movies category. Step 3. After all wanted videos are selected, click "Sync" button to convert and transfer them to iPhone. Soon, you can find selected videos are put into iPhone. Play it, no problem! In turn, you can export video which won't play on iPhone to computer via WinX MediaTrans and then remove it from iPhone for space saving. ▪ Free Download SD/720P/1080P/4K/8K/3D (music/movie) videos from YouTube, Facebook, Dailymotion, Vimeo, Metacafe, MTV, Vevo, Instagram etc. (300+ in total) in a flash. ▪ Convert and compress any downloaded/local SD/HD/4K/8K videos to MP4, AVI, WMV, MOV, FLV, 3GP, iPhone, iPad, Android, Windows Phone, PS3/4, Xbox with high quality. ▪ Extract audio files (MP3, WAV, AAC, AC3, FLAC, iPhone Ringtone etc,) from music videos/movies and creat slideshow videos with BGM from (guraduation, wedding) albums. [Answered] Dose iPhone Play HEVC/H.265 Video Natively? How to Fix 720P/1080P HD/4K UHD Video Play Problems?